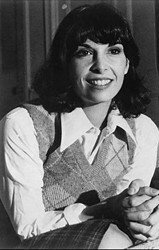 Talia Shire is a two-time Academy Award-nominated American actress. Shire first became famous for her role of Connie Corleone in The Godfather and its sequels. Talia is probably best known for her role as the plain-looking girlfriend (and later wife) of Rocky Balboa in the Rocky movies. Here is a tribute to Rocky and Adrian. The Godfather Part II... Connie Corleone Here is an interview with Talia on The Godfather.